This past week has been relaxing. I have still had homework, but I feel like there has been less going on. I decided yesterday, that I would go do a little shopping. I feel like I spend the majority of my money on gas and groceries. I finally stablized the grocery bill. It was a little out of control for a while. Not scary out of control, I would pick up a few extra things that were not really necessary. that would spoil easily, or would be something that I could easily make on my own. Things like the pre-made chicken salad or a fancy dip. I was also looking for a dress for Easter. I remember freshman year, going shopping with some friends and not really finding anything. I was also looking for more business casual. I have a formal presentation coming up and realized that I don’t have anything to wear with my black dress pants. I found two dresses, a rare thing. 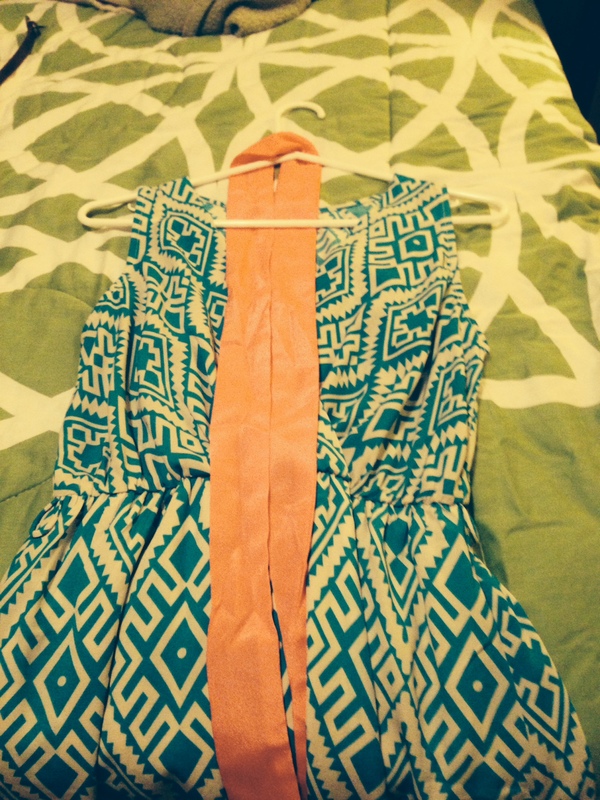 One is a lighter blue with a coral ribbon/sash thing as belt. Normally, I go for solid. I tried it on and it fit great, which was rare. 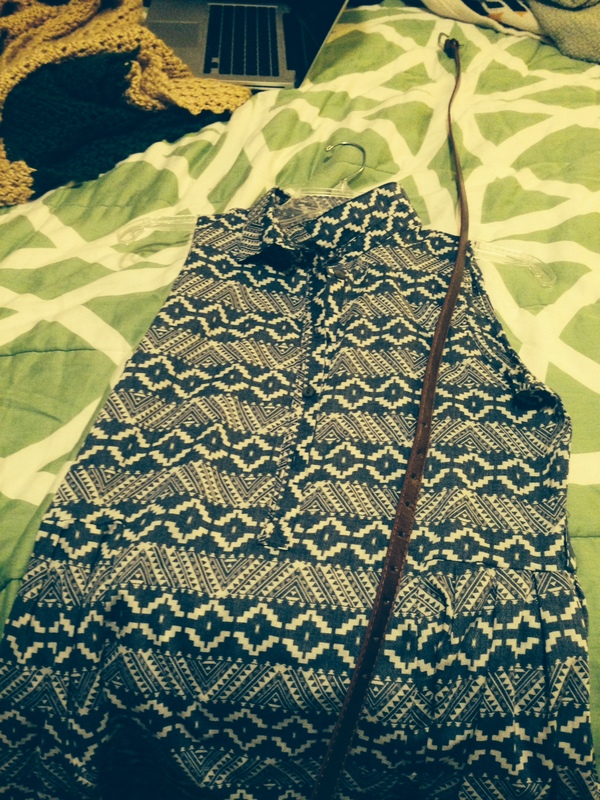 The other dress is a darker blue/grey with white pattern and a high collar. Which usually, I am against but it fit really well. I just really liked it. I got one on sale which was great. I was happy. I also have a dress for Oxford which makes me feel a lot better. How this all relates to Lent, weather wise we are in a transition shedding our winter skins for a way into spring. Much like with Lent being a time of waiting and moving forward to the cross and then Easter comes and we are all happy because of Christ has risen. As I reflected on this journey. Ash Wednesday seemed like a long time ago, but know it is almost Easter. 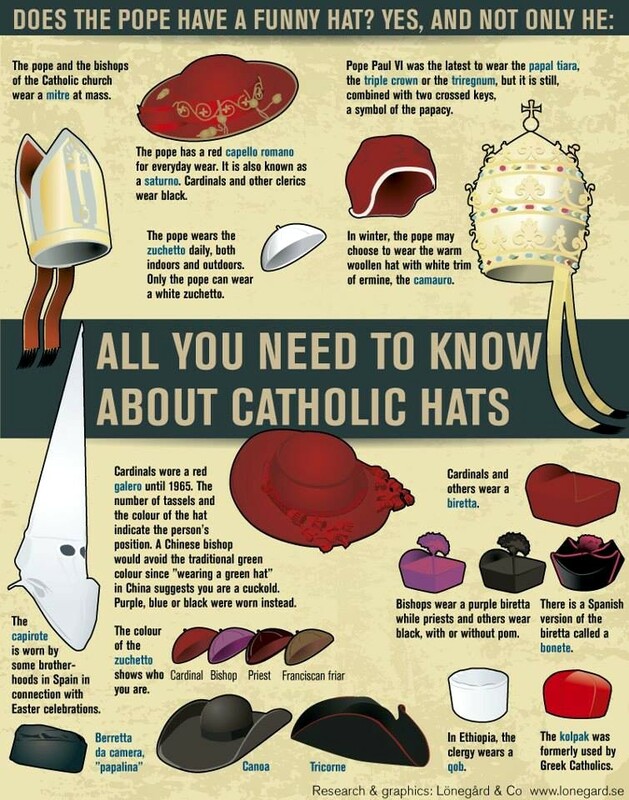 Also I found this cool picture of hats that the Pope wear. I am really late on this one. A lot better then what I thought it was going to be. It took a long time to get into it and the movie was not that great. I just read the first book which included Good Wives as part two. I avoid this book when I was younger and finally getting around to reading it. I am such a routine kind of person. Yesterday, was Sunday and I went two different church services. Mass in the morning to have some quiet Jesus time and then in the afternoon with the Anglicans to check out their new mission church in Collegetown. My sister and her boyfriend also came done with some other Anglican friends to worship as well. It was good to see a church thriving and what was cool about the mission church was that yesterday, was the first day that they became a church. They went from being a mission church to a stable church in the Anglican community. I also got to meet the Bishop (he has a cool hat and staff). It was great. It was similar to what I had been to in the morning except for Commuion. I am allowed to recieve in the Anglican church. Usually, I go forward for a blessing from the priest when I am at Mass. It has been a while, I long while since I have recieved the scarments. I was nervous, a new place not really sure how things were done. I gave the wafer to the priest that was giving people the wine and he dipped it in. I did not however know that he was going to place it my mouth instead of giving back to me. I have heard of this before, so it did not freak me out. It was strange immediatly recieving both the body and the blood at the same time without me touching. I could feel Jesus working through the hands of the priest. There are also so many good things that are going to come out of that church. I could feel it right there. There were also so many children. It was good to watch four little girls be in charge of the offering except for one dropping the plate on the ground. They also had such respect for God as they approached the alter, they were dramatic in their bowing but it reminded me that we are in the presence of God and that sometimes we need to be a little dramatic to remind us of why we are in this place. I also faulted in some of my sayings, I have grown accused to the wordings that I hear at the Catholic Mass that I go to regularly. I stubbled through a creed that I haven’t said in a long time and was confused on when to bow or make the sign of the cross. I also missed my Missal, I don’t depend on it any more but it still sits beside me all the time. I heard hymns all throughout the day that I forgot existed. They felt different but I could still remember the words. The simple act of praising God through singing. I made note of each hymn that I missed and added to my collection of things I haven’t heard in a long time. Yet, I still remember as I stood both in the Catholic tradition and in the Anglican tradition that the words are the same. Hymns are the universal thing that I feel binds churches together. It’s such a simple act and worries me as the old hymns are going away and new hymns take there place. If you get a chance, go somewhere different on Sunday. Expereince God in a different way, because yesterday I did. I saw God in the people at Mass at the Anglican church. I also saw God in the people at the Catholic church like I do every Sunday. Drop everything right now and read this. I am not kidding. Not really the story I was looking for but interesting. I felt that Scott’s section was more theology base and Kimberly’s section more feeling base, I am not really sure how to explain it. A book with priest, in which priest are interesting people. Interesting concept but not really sure how to feel. Like all college books, college is nothing like this. Also don’t go to the same school as your twin sister. Make your own memories. Drapling a bit in theology for a while. I get to spend the whole next semester wrestling with Augustine. Who knows where I will end up in my journey. Except for the amazing expereince that I had at Mass, I went forward to recive a blessing for the first time. Had a renewal of faith moment. I want to feel that every Sunday, maybe I am just confused like my friend thinks. This semester I have been thinking a lot about prayer. Different types of prayer and trying to get better at praying. Over my break when I was doing my morning reflections, I was thinking about how Advent, also a season of penitence, has changed in my life over the last few year. My freshmen and sophomore year it was used as a counted down to when I was going home. This year it is different becuase I am staying so late after finals since my counsin is graduating. This year, however I have been reflecting on prayer. The other day, I was listening to a podcast that was talking about diffent ways to prepare for the birth of Christ. One of the suggestion that was given was changing the prayers used during meal times such as just saying: “Come Lord Jesus.” (the meal time prayer that I grew up saying). During my nightly prayer time, which is usually just a quick prayer from my Lutheran Book of Prayer. I prayed a rosary for the first time and it was interesting. I used my fingers to count. I have been exploring the idea of intercession since it came up about a month ago in my Catholicism class. I am not sure what I believe about Saints intercessing on my behalf but for some reason I like the idea of Mary intercessing on my behalf. As my sister told me it was like asking somebody to prayer for you but they can’t answer but share it with Jesus, who can. I could totally be wrong. The lecture today fit with the season of Advent. Mary, the mother of Christ, waiting for the birth of her son. As my professor said on the issue, “What son would not deny his mother.” Mary becomes relateable becuase she watched her son suffer on the Cross and was there when he was raised again. There is something mystical about the whole expereince. This is one of my favorite parts of the service because there is something mystical that happens during the consecration of the bread and wine. It is strange to think about how in the middle ages the average person would pay to get a better view of the bread and wine because the Church viewed the scarments as something that preist and bishops could only take. I know what the average person must have been feeling when I sit in Mass, I can’t go forward to revice and I am to nervous to go up for a blessing by the preist. I hope that this is the Eucharist becomes our prayer as we wait for Christ to die, be raisen, and for him to come again. Let us remember that Advent which comes before Christmas is a season of penance that we should make this time special and continue to pray as we wait for the coming of Christ. So every once and a while my American Lit. professor declares it poetry today. Today was that day. This poem really struck me, I am about 100% sure that I read it before in my other American LIt. class but could not find it anywhere in my typed notes. I just thought I would share. I really like it because it shows a sweet moment between a father and son. My professor kept describing it in positive terms. I am still not convinced, I could see how it is positive but the father has been drinking but not a lot. I think maybe an after dinner drink or maybe he is drunk. I just really like it. We all did agree that the mother was not happy. The first time I have been sick all semester. I thought this was happening weeks ago but nobody I got the full blown sinus inflection. Good thing for Sinus medication or I would cry. I cried all last night because I could not sleep. I was reading an article on Cormac McCarthy and decided around 1 that I should make some attempt at sleeping. I fell asleep around 3 got up around 9:30. I think I was more frustrated at trying to fall sleep because I was worried that I would stop breathing. I was finally able to clear one side of my nose to feel comfortable and I don’t like sleeping with my mouth open. I spent yesterday organizing my schedule for next semester. I was planning on a lunch break but it looks like it will be more of a brunch type thing. Similar to this semester, Hebrew remains at the same time. I am scared to death to change professors. I am also taking Advance Expository Writing to help prepare for graduate school. (Hold the phone). It’s happening. About a month ago, I had a meeting with one of my favorite professors and he basically asked if I wanted to teach. I give an I am not really sure, yes type answer. I feel like I need to sit down the weekend after my Hebrew exam and finish taking the GRE practice for the second to see how I will do on the writing section. I missed calculated the amount of time used for the writing. I thought the 30 mins. was split in half for both the prompts. I scored really high on the math section (surprising). I might shoot him an email after I take the practice again with an update on my life. I not sure if he wants to hear about my decision. I feel like he has invested time out of his schedule to talk to me so I should let him know the outcome. I also see him at Mass all the time, even though I know he ignores people (which is a good thing, focusing on yourself during worship is the best). I am such an awkward emailer. 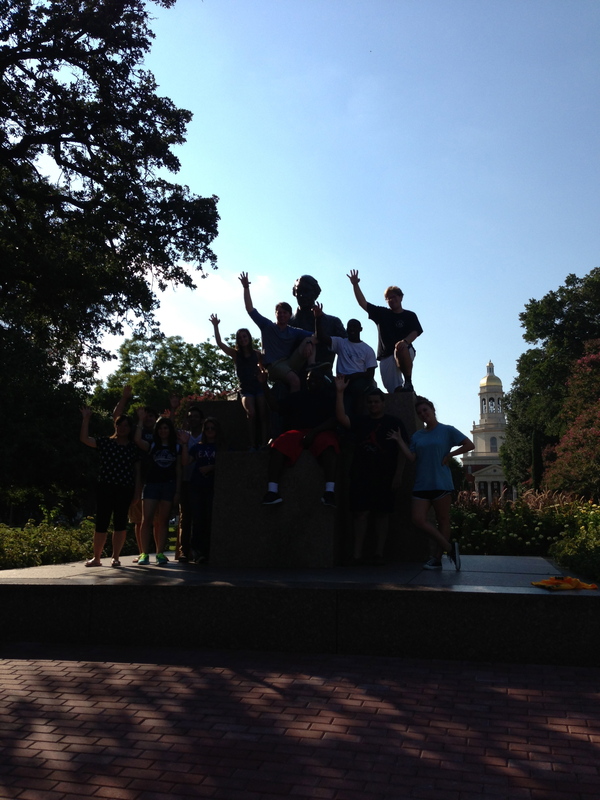 I know for sure that I want to teach, the U1000 Peer Leadership experience gave me the opportunity to teach/ TA for an undergraduate transition course. It was amazing because I got to see my students grow from day one. I got to plan out the last day of class and they got donuts because I love them. Planning a class is stressful and hard. Also, I had four of my students stick around after the last class and tell me how much they appreciated all of my hard work and really enjoyed learning from me. It was wonderful. I am taking American Lit. through Whitman and hopefully Postmodern American novel. American Lit. is my unofficial concentration, so in my mind I have to fit as many of these in while taking English Lit. and British Literature class (poop). I am also waiting listing a class for the first time, not really sure how it works. I might be taking Augustine’s Theological Development if Postmodern American Novel does not work out. Which means I have to declare that minor that I have been talking about for the last four months. I have never read any of Augustine’s works so this might be helpful. I have a feeling that it is going to be a difficult class. For my physical activity I am taking a Civic Education course in Community Garden: Growing a Community. Even if I am not working I will be volunteering in the community. I have already contacted an organization on campus that I can get my hours counted towards for next semester.